Today morning at Deera Gali, after good heavy tummy filling breakfast of Aloo-Parothas, bread butter Omelet at the cottages; we rode our motor bikes to Buffliaz. The first thing what we did here at Buffliaz, is that since we knew that during "Ramadan" fasting month we wouldn't be getting any food from Dawn to Dusk, to eat on the way. So we bought dry-fruits, fruits, biscuits and some packets of other eats, so that we don't starve on the way. Buffliaz is about 22 Km from Deera Gali. Now all along upto Buffliaz, it’s a steep descending road. Buffliaz is a beautiful hill spot situated on the foothill of Peer Rattan range, 39 Kms east of Poonch town and is situated on both the blanks of Poonch river. The village is named after the horse of Alexander the great (Bunifales), who is said to have been buried there. Situated, at the foothill of 8,600 ft. high “Rattan peak” on the historic Mughal Road is about 45 Kms from Poonch Town. “Behramgala” is small picturesque spot in deep gorge. It is small plateau surrendered by mountains and forests. Just near to it is the confluence of “Thatta-Pani” and “Parnai” stream which further add to its otherwise scenic and natural beauty. The waterfall at Noori-chamb, is like in a maze. It is completely curtained with a huge mountain rock that makes it exclusively secluded and private. The sheet of rock covering it makes it not visible from a distance at all. Unless we go closer to the falls, we can’t view anything from a distance. That’s why Queen Noor jahan, preferd this place, so that when she bathed under the waterfalls, no one could see her. Fom Buffliaz, to go to Noori Chamb, we have to take a diversion of about 8 Km in side from the main Mughal Road. Noori Chamb is a famous waterfall in the district. It is also connected with the Mughal Emperor’s wife Noor jahan. Noori Chamb is located in the North East of Behram Gala. This waterfall is yet another scenic picnic spot where lots of picnic lovers come to spend their joyous day with fun, music and their favorite delicious foods and beverages.The Fall of the stream gives rise to a dense clouds of water vapors which engulfs the whole area and spreads all over. The Emperor Jahangir and his queen Noor Jahan had developed so much fancy and liking to this waterfall that he named it as Noori Chamb representing her identity . On the way to Kashmir, the Mughal Queen used to relax here and would refresh herself with bath under the waterfall. She also got a full size mirror fixed near to the waterfall, till date, whose remains are still there. Because of the constant repairs at this stretch of the road, we had to stop nearly at 30 to 40 places, till we were cleared to proceed further by the road clearing heavy machinery operators. Finally we reached "Peer Ki Gali" top. It's a narrow pass that connects Poonch district with Shopian town of distric Pulwama. I believe, once we passed these land slide areas, it started raining heavy and the road got closed for nearly for 45 days. So we were lucky that we just covered the bad stretch of the land-slides, before it closed down. Peer Ki Gali, is the top most mountain pass, which has a tomb of "Baba Sheikh Karim", one of the famous Muslim Peer, where on Thursdays, Hindu & Muslim devotes from Kashmir valley and Pooch district, throng this holy place just to have picnics and devotional prayers. This tomb is situated at an height of nearly 11,500 feet from the sea level. Peer Ki gali is situated in “Pir Panjal” mountain ranges. This mountainous range varies from 11, 500 feet to 14,000 feet. Peer Ki Gali surroundings are full of lush green meadows, abundant green pastures, perennial fresh and cold water flowing streams, sailing clouds, freezing winds. There is a very blue water beautiful "Lake Nandansar" just 2 KM away from the Peer Ki Gal tombi. From this highest view point, there is an amazing panoramic view of the whole Peer Panjal mountainous valley. All most all the vehicles passing through this mountain pass, stops here to enjoy the panoramic view of the valley and also to seek the blessings of the Peer Baba. We too stopped here to refresh ourselves with hot tea, dry-fruits and the biscuits that we had carried from Buffliaz. After savoring the panoramic view of the region, as well as after seeking the blessings of Peer Baba, we drove down towards Shopian town. From here the road is criss-cross, but is fairly ok and it is a constant descend up till Shopian town that is about 40 Km from Peer Ki Gali. From Peer KI Gali we reached Shopian via Peermarg---Lalgulam---Zazinadh---Dobjan---Heerpor---Shalwasan---Borihalan—Shopian. The waterfall of Aharbal is situated 35 km away from the Jama Masjid Shopian. This waterfall is created by the water of “River Vishav” and the waterfall has a height of nearly 100 feet. 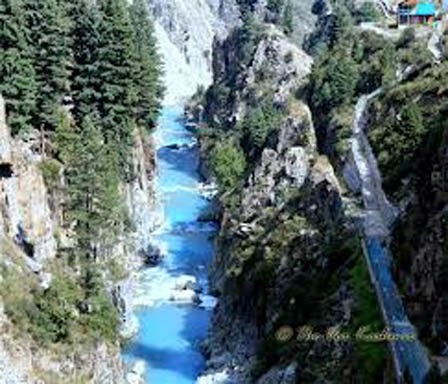 The source of River Vishau is from the “KONSAR NAG” (Nag in Kashmiri language means Lake), which lies in-between the three peaks of “PIR PANCHAL” Ranges. This Lake is situated at a altitude of 12,800 feet above the sea level and is fed by the surrounding glaciers of “PIR PANCHAL” ranges. The alpine meadow of Kung-watan lies at the halfway point of the two-day trek to the high-altitude Konsurnag Lake, which is the source of the Veshu River. By the time we reached from Deera Gali to Shopian town via Peer Ki Gali, it was round about 3:30 PM. We were practically exhausted by ridding on one of the toughest terrain, nonstop for almost 8 hours. We were completely famished and were at the verge of dropping dead, because of exhaustion and hunger. The anxiety was that because of “Ramadan” fasting month, whether during the day time, we would get any food to eat or not. Since at Aharbal town my brother Bushan Parimoo personally knew few local Muslim leaders, who are his good friends also. My brother succeeded in convincing them that since we are not Muslims, and we are starving, we should be serve cooked food. They took pity on our starved state and served us cooked food but secretly in private enclosed enclosur and not openly in public view. The way we ate the food, any one would think that we were famished. At Aharbal, we thanked Bushan Parimoo’s friends who provided us food and proceeded further to our onward journey to Youshmarg, where we had planned to stay for the night. The short cut road from Shopian to Yusmarg via Keller, was so awful that we cursed ourselves that why the hell did we choose to go to Yusmarg. All through the journey the road was full of pot holes, big ditches, uneven boulders paved in mud, craters with perpetually all neglected road. We dreaded this short cut route. Our not only whole bodies ached and pained , even our skeleton joints got completely de-hinged and dislodged. The journey was awfully terrible. Even now when we think of that awful journey, It still sends deep shivers down our whole existence. We reached Yousmarg by 7Pm and checked in to one of the tourism huts. We practically dragged our painful limping bodies to reach the log huts which were far from the entrance of the check-in office reception. After dinner we slept like dead caricatures. Infact Yusmarg has a great scope for adventure tourism. Doodganga a river flows through this meadow. In its vicinity lies the alpine meadow of Tosa Maidan. A trek of 4 km leads to a small Lake named as Nilnag surrounded by pine trees. Another 10 km trek leads to the most interesting lake the frozen lake in Sang-e-Safed valley, most portion of this lake is covered by ice even during the summer. But I still can’t understand why the hell tourism department has totally neglected Youmarg. WE CALL YOU VEER. 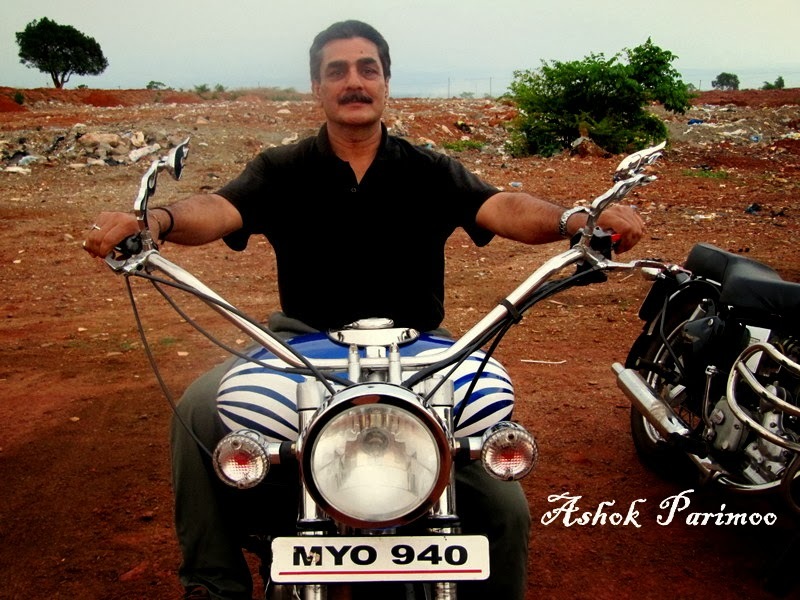 MY REGARDS TO ASHOK JI,HE HAS NICE HOBBY.KEEP IT UP.